How do I record audio using Flash in the Rich Content Editor as a student? If you are using Chrome or Firefox, you can record audio using HTML5. However, if you are using Internet Explorer 11 or Safari, you must use Flash to record audio in the Rich Content Editor. The Rich Content Editor is used in features that support the editor (Announcements, Assignments, Discussions, Pages, Quizzes, or Syllabus). You may need to Enable Flash in Internet Explorer 11 or Enable Flash in Safari before recording video. You will also need to use the current versions of your web browser and Flash. Open the Rich Content Editor using one of the Canvas features which support the Editor. Click the Video Clip icon to open the Media Comment Tool. 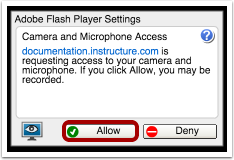 Click Allow to give the Adobe Flash Player access to your computer's camera and microphone. 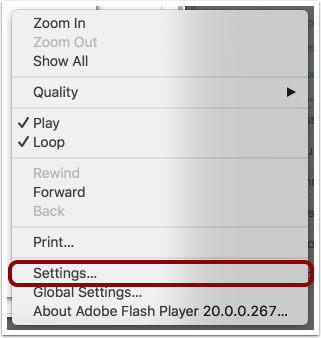 You can open the Settings for the Flash Player to select specific options for your audio recording. To open the settings, Right-click (PC users) or Control-click (MAC users) anywhere on the media window. 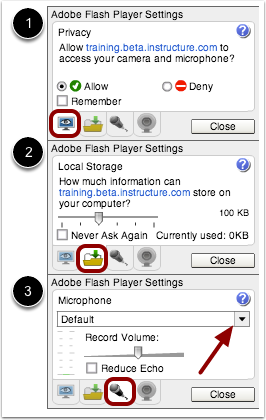 You can select among the Flash Player Setting tabs and select your privacy settings  and local storage limit  on your local computer. You can also select a specific microphone using the drop-down menu if your computer contains more than one option . 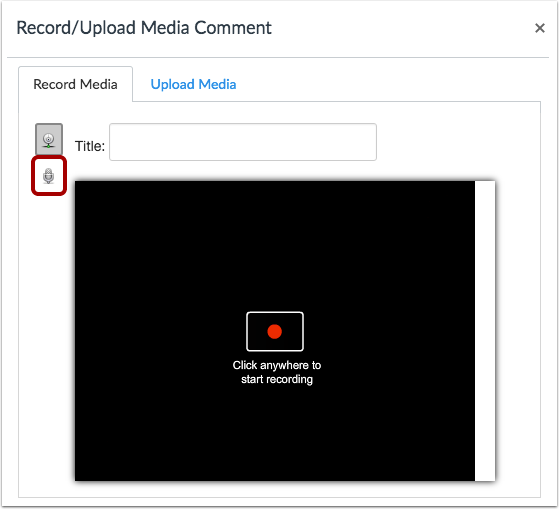 Click to start recording an audio file. 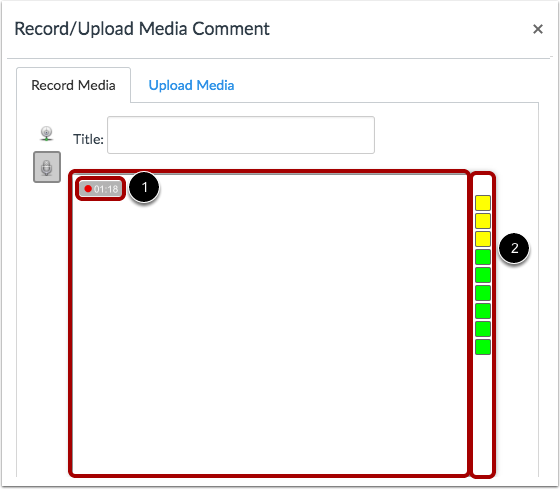 The time  and the volume level  of your recording will continuously update as you record. Click anywhere to stop recording. Your recording will begin to playback automatically. To save your audio recording, click the Save button . 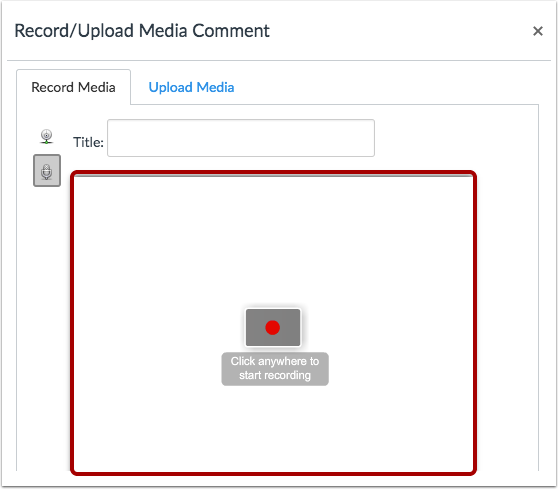 To re-record your audio message, click the Record button . View your audio recording inserted into the Rich Content Editor. Click the Save button to save any changes in the Rich Content Editor. Note: When using the Rich Content Editor in Pages, you have the option to Save. When using the Rich Content Editor in Discussions, the Save button appears as “Post Reply”. In Assignments, the button appears as “Submit Assignment”. In Quizzes, the button appears as “Submit Quiz”. Previous Topic:How do I record audio using the Rich Content Editor as a student? Next Topic:How do I upload an audio file using the Rich Content Editor as a student? Table of Contents > Rich Content Editor > How do I record audio using Flash in the Rich Content Editor as a student?